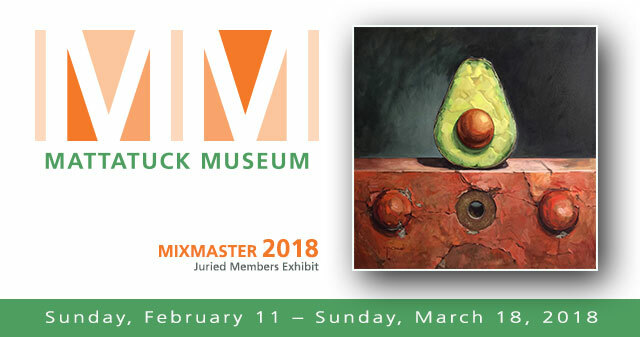 I’m very happy to have my painting Avocado and Rivets selected for the MIXMASTER 2018 juried exhibition at the Mattatuck Museum Sunday, February 11–Sunday, March 18, 2018. MIXMASTER is an exhibition that seeks to discover and recognize the talents of artists working in New England and the Tri-State region. Initiated to support and recognize contemporary art, MIXMASTER provides an opportunity for established and emerging artists to debut their most recent work. The Mattatuck looks forward to highlighting the work of its artist members. Works will be judged by Sara Shaoul, Director at 601Artspace. Reception & Awards: Sunday, February 11, 1:00–3:00 p.m.
Sara Shaoul is the director of 601Artspace in New York City. 601Artspace partners with artists, curators and other not-for-profit organizations to produce unconventional exhibitions, talks, film screenings and special projects within a non-commercial context. Often its permanent collection acts as a catalyst for artistic and curatorial encounters. Through such interdisciplinary practices, 601Artspace engages with and investigates issues in the production, organization and reception of contemporary art.